Hey, another Drax. Did we need another Drax? Um, not really. The first one was fine. This one is pretty much a copy with a new yelling head. 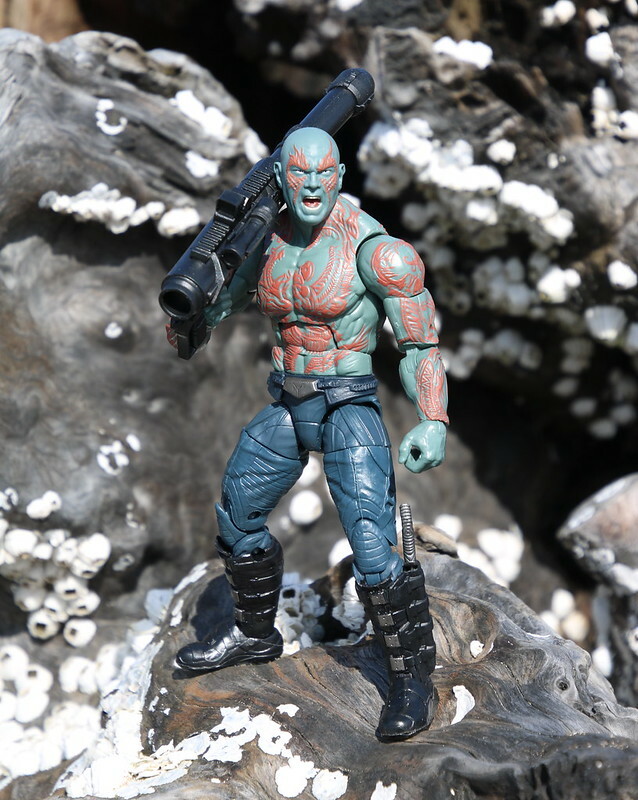 Drax comes with a rocket launcher this time around, and not a fancy space rocket launcher. It is a newer looking version that the model we saw that came with The Punisher and Deadpool (who used the same model). It looks a lot more like a ground to air defense missile launcher. Perfect in the hands of the big guy. Since this was not used in the movie, and Hasbro probably didn’t want to go to the cost of giving him a one-off weapon, I am guessing we will see this one show up again soon. He also comes with the two thin blade knives we saw in the first figure, as well as the Guardians comic exclusive set. Here is one of the pics of Star-Lord unmasked I promised y’all. Comparing the two Draxes, it is the same, save for the color of his pants. The color of their skin is different too. So unfortunately if you like one color of pants over the other, you are stuck with the heads attached to the body they came on. This is a fine figure. It was good the first time around, but a bit stale the second. You definitely need the figure to get all of the BAF parts, but at least I am on my way to three complete sets of Guardians. HAHA!!! Next up, we will visit the comic world for a few figures and see how those new figures stack up to the movie figures. Marvel Legends – Groot – Finally I have Nova!! Finally, finally, finally I found Nova and got the last piece of Groot. It makes me crazy that Marvel Legends puts out the BAF and then they don’t have enough of one figure, thus creating an unfinished BAF… in this case, Groot, that I wanted more than any of the other figures. The detail work on Groot is amazing! From all of the little veins and wood pieces, to the gentile addition of moss, and of course the face is the best. The Guardians are finally all together. I can’t believe how amazingly tall Groot is. Since I had most of the pieces, I could see he was going to be big, but this guy is HUGE! I still don’t know why they went with two characters who were not in the movie. There were plenty of other characters I would like to have seen in this wave. 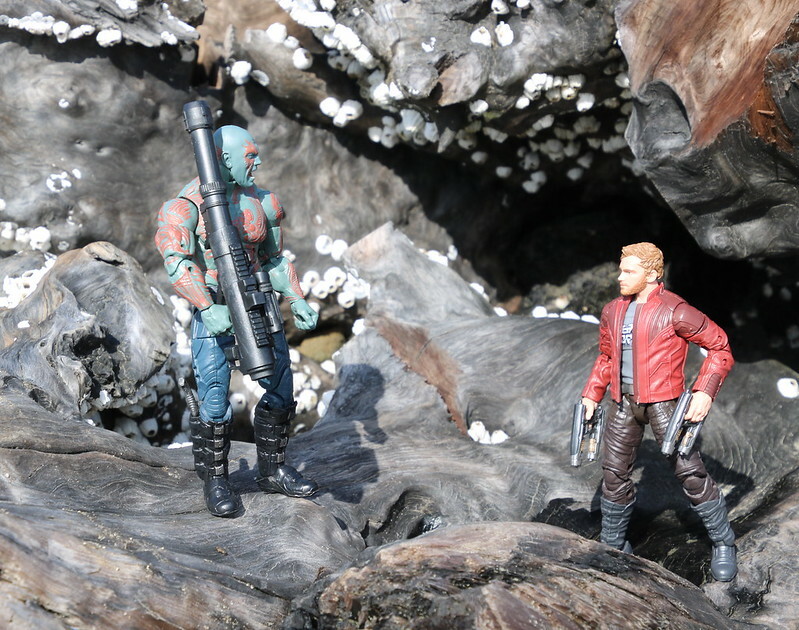 For a second when I saw the tiny little 2.5 inch Guardians of the Galaxy figures in the store, I was thinking “Why would we want something so small, when we are getting them in the Marvel Legends line. Then it hit me. The vehicles. I have been hearing about the vehicles, and they do not disappoint. I have the first two, the Rocket Raccoon’s Warbird, and the Milano. Warbird comes out of the box in a few pieces. The main body and the two lower wings. There is also a pack that has two more body parts (which I think are weapons) that attach to the underside of the top wings. The pack also includes Rocket Raccoon as well as a blue Battle Gear with a missile launcher. The Battle Gear come with all of the 2-pack character sets. This is a great looking ship when all together. It looks reminiscent of a Babylon 5 fighter. I really like the design of the double wings. The top set of wings can move up into a battle mode of sorts. It is not a whole lot of movement on the toy, but considering it is 2.5in scale, it is a lot of motion. I was a little bummed when I put Rocket in the cockpit. It is a standard seat for anyone to use. That means Rocket just falls down into a laying position. And he rattles around in there when the ship is flying around. The Milano comes in a whole lot more parts. Three sets of wings, the canopy, small black engines, 2 missiles, and Star-Lord. There is one more set of wings already attached to the vehicle, which move back and forth. Once together…that is a LOT of wings. On the third wing down moves, though it looks like there will be movement in the top and bottom wings as well in the movie.Those would have been great to see with pivot points. The Milano and Warbird together. The Milano is quite a bit larger. It has a cockpit that seats 3 figures, and features lights and sounds. Gone are the days of including 2 AA batteries. Once supplied, the black button on the back makes a number of weapons and engine sounds. The lights are integrated into the front of the craft making a sort of ‘T’ shape along the front nose of the ship. These are two fantastic ships. I am really happy with these two so far, and I am looking forward to more. Ronan and Star-Lord. This is a different Star-Lord than the one that comes in the Milano. This one is masked, and has on his trademark red trench coat. Ronan is all suited up and ready for battle somewhere. Each 2-pack comes with Battle Gear, which consists of a missile launcher, and a sheet of weapons similar to the weapons packs in the Teenage Mutant Ninja Turtles sets. These however go on the ships. All except for Ronan’s hammer. The missile launcher that comes in this pack does not fit on the Milano or the Warbird. And that is surprising, since there are about 30 ports between the two ships. This is a good pairing of Drax and Korath. Two larger than life strong-men. They come with a green Battle Gear, and a rocket launcher that matches the launcher that comes with Warbird. I am so impressed with the details of these small figures. Well done. Groot and Rocket, together again as one character. Rocket doesn’t have any articulation, so he is more of an accessory. This is the same Rocket that comes with the Warbird. I could see the need for a whole bunch of Nova Corps Officers, but too bad we don’t need extra Groots or Rockets. Overall, I am ecstatic about these figures. They are small, but very well detailed, and even come with some articulation to fit into ships. The two ships are equally as impressive with details and moving parts. I would like to have seen some weapons for these characters to hold. Little guns at the very least. I can see this moving to a whole new world of Marvel figures for Hasbro. They can go a long way with this scale. It would be impossible to make vehicles for the Marvel Legends size figures, and it would even be a bit large for the Marvel Universe scale. Those guys are about the size of a GI Joe, and they have really big cars and planes. At this scale, we can see more of a variety. I wouldn’t be surprised if Hasbro wasn’t a little sad that they didn’t have this scale with the Avengers movie. We could have had Shield cars, motorcycles, jets, and then of course, leading up to the Heli-carrier. Well, they have this scale now, and we are leading up to Avengers 2. Let’s keep going with this scale. And of course, as always, there are LOTS more pictures on my Flicker page.